Two Book Friday!!!!!! Got a couple of good ones this week. First is The Great Art Treasure Hunt, this book takes famous works of art and turns them into an I Spy game you can play with the little one, it is super cool. 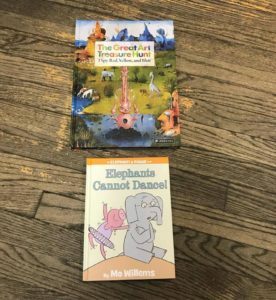 Also this week, from the amazing Mo Willems we have Elephants Cannot Dance, a fun early reader book I highly recommend!